Satellite image provides a valuable tool for understanding the land use/land cover pattern over a large area. 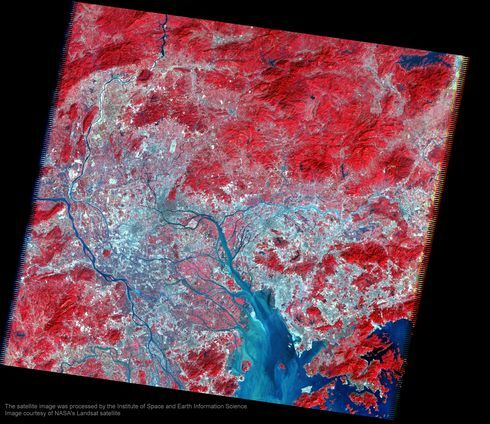 This image provides a snapshot of the Pearl River Delta in South China, with Hong Kong being shown in the lower right corner. In this satellite image, taken in November 2005, red indicates vegetation cover, grey indicates built-up area, dark blue indicates water and light blue indicates sediment-laden water. Satellite image, one of the products from remote sensing techniques, reflects light radiance of any object at numerous ranges of electromagnetic spectrum. Among the ranges, the near infrared region is commonly used to assess the change of vegetation cover and water quality. As clear water gives almost no reflection in the near infrared spectrum, it often appears to be dark in colour. However, when water is filled with suspended sediment or pollutant, this will allow better reflectivity and result in a brighter appearance.